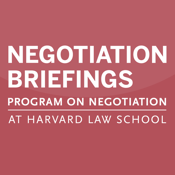 Negotiation Briefings is the leading publication on negotiating and mediation and is brought to you from the world’s best minds at the Program on Negotiation, a consortium of between Harvard, MIT and Tufts, that is dedicated to developing the theory and practice of negotiation and dispute resolution. Written in a quick reading, practical format, Negotiation Briefings teaches you how to successfully navigate, troubleshoot, mediate and resolve conflicts, and build and maintain important business relationships. None of the information in Negotiation Briefings is just theory. Its always proven, tested and derived from real-world situations in from every possible industry and environment. In every issue of Negotiation Briefings there are monthly feature stories, like “When Values Are A Barrier to Negotiation, as well as insights into some of the most difficult, current and prominent negotiations and one of the most popular features, “Dear Negotiation Coach,” where readers get to ask personal issue-specific questions that are answered by our faculty. Be the negotiator, conflict manager, crisis responder and leader that you want to be when you subscribe to Negotiation Briefings. Master the art and science of the world’s leading negotiation experts.